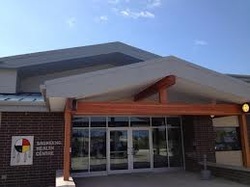 The Sagkeeng Health Centre (SHC), also known as the Fort Alexander Health Centre Inc., is a community health centre funded through Health Canada - First Nations Inuit Health Branch (FNIHB) serving the Sagkeeng First Nation in Manitoba. A broad range of health services are provided by SHC to members of Sagkeeng as well as the larger community including mental health counselling, pre- and post-natal programs, immunizations, suicide crisis response, addictions counselling, home care services, diabetes education, parenting programs, and more. SHC also manages a clinic which provides physician services, dental services, and a pharmacy. The Sagkeeng First Nation envisions a healthy community where members benefit from an optimal level of physical, emotional, social, spiritual health, wellness, and traditional lifestyle practices. Our vision is rooted in a deep respect and understanding of our Nation's history and traditional knowledge and the role that knowledge plays in shaping the kind of morals and values that create good health and a sense of wellness. To manage in a fiscally responsible and transparent manner, which contribute to the physical, psychological, social and spiritual health of the organization's staff and community served. To enhance the health and well-being of individuals through innovative, responsive services delivered in partnership with our community, Interlake-Eastern Regional Health Authority (IERHA), and others who share our vision. "Sagkeeng" was the Aboriginal name given to the willow-crested peninsula marking the meeting point of rivers and streams at the mouth of Lake Winnipeg, known to the original Cree, Assiniboine, and Ojibway inhabitants as the "Meeting Place". During the fur trade era, Sagkeeng proved to be an ideal passage route and trading post, utilized by historical trading rivals, the North West and Hudson's Bay Companies. The original "Fort Alexander" was built by the Hudson's Bay Company in the late 1700's to serve as competition with the two existing North West Company forts erected earlier that century. Both companies conducted regular trade dealings with the various First Nations settled in the surrounding area. In 1871, Sagkeeng First Nation was signatory to Treaty 1 represented by "Kakakepenaise (William Mann I). At the time of the signing, they were regarded as Fort Alexander First Nation. The Sagkeeng people are direct descendants of the Anishinabe tribes that migrated from the Ontario Sault Ste. Marie area during the 1700's. Their ancestral language is Ojibway. Situated on the southern tip of Lake Winnipeg, Sagkeeng has a registered population of close to 8000 with approximately half of the Nation's members residing on-reserve. Historically, traditional hunting, trapping, fishing, and trade were the First Nation's main economic resources however, its current economic base is now largely government services and some commercial business.